Interlibrary loan is the process by which requests for information or materials not found in the library's collection or from electronic resources available at the library will be fulfilled. This process allows the Ethel Whipple Memorial Library to enhance its services for patrons, but in no way replaces collection development attempts within said library. The Ethel Whipple Memorial Library adheres to the principles relating to Interlibrary Loan included in the ALA Interlibrary Loan Code, the Texas State Library and Archives Commission Interlibrary Loan Protocol, the U.S. Copyright Law, and federal and state laws governing confidentiality of records. Interlibrary loan is a service offered to all registered borrowers of Ethel Whipple Memorial Library ages 18 or older. Said patrons must be in good standing; i.e. having no fines, overdue materials, or otherwise questionable status. Allowances may be made at the sole discretion of the library director. Patrons are responsible for providing adequate information to library staff to locate the book(s) or item(s) requested. Information required should include proper spellings of author and title, subject, publisher, publication date, and ISBN. Complete citation information, including author, title, periodical source, date and/or volume and number, and page numbers should be included for articles. 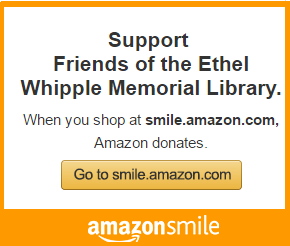 Ethel Whipple Memorial Library charges a $5.00 fee per book for interlibrary loan service to cover shipping charges. The library reserves the right to limit the number of items requested or borrowed by a single user at one time. If the material is damaged or lost, the patron is responsible for the replacement cost of the materials plus any processing fee the lending library might require. The loan period will vary depending on the policy of the lending library. Materials must be returned by the due date. There are no renewals. Failure to return materials on time may result in suspension of library privileges and could also incur fines in accordance with library policy. Ethel Whipple Memorial Library will lend materials, including books and photocopies of books in accordance with federal copyright law. All materials loaned will have a loan period of 4 weeks. Materials may not be renewed. Charges for lost or damaged materials will be based on the current replacement cost of the lost or damaged item. This fee is nonrefundable.